Covers the revised CXC Information Technology Syllabus. 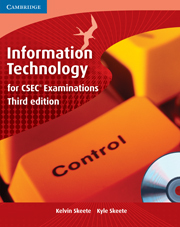 This full-colour third edition of Information Technology for CSEC® Examinations completely covers the revised CSEC® Information Technology syllabus (CXC 30/G/SYLL 08). In addition to Information Technology theory, problem solving and programming, this book teaches students essential practical skills using Microsoft Word®, Excel®, PowerPoint®, FrontPage® and Access®. Written by an experienced IT lecturer and consultant, and an IT tutor, this fully updated edition includes new sections on Microsoft PowerPoint and FrontPage in addition to revised sections on Microsoft Word, Excel and Access (both Office 2003 and Office 2007); dedicated problem-solving and Pascal programming sections; exercises at the end of each chapter; CD containing the files used in the exercises; full-colour screenshots and diagrams to illustrate the various concepts. For more information and to purchase your Caribbean resources, go to our How to order page. A new section devoted to Pascal programming. New practical sections using Microsoft Office® 2003 and 2007. New sections covering Microsoft PowerPoint® and FrontPage®. A new section dedicated to problem solving. Concise chapters that organise information into accessible units.